Eight talks, showing the highest quality research or recollections, are now on DVD. Celebrating Bletchley Park was a feast of expertise and history, containing contributions from the top Bletchley Park historians, computer restoration experts and from codebreaking veterans themselves. The event particularly marked the importance of the women employed at Bletchley Park, making up approximately three-quarters of the entire workforce. 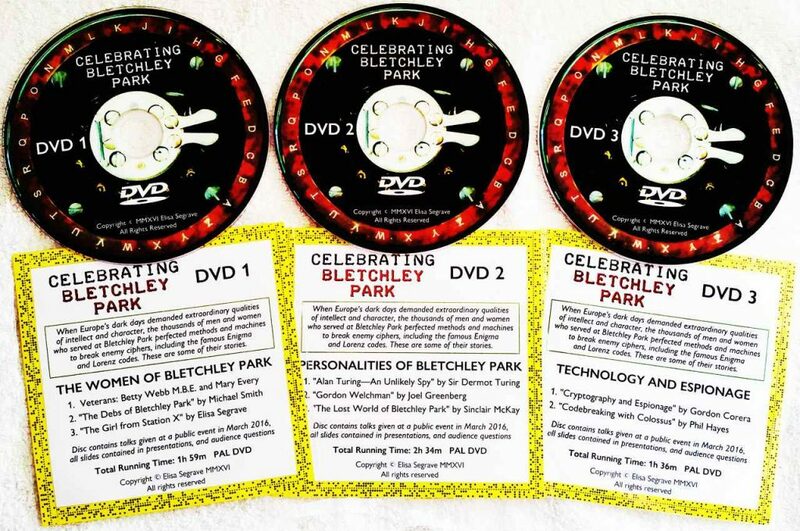 Now, for a price way below the admission fee, you can own films of the wonderful conversations with Bletchley Park veterans Betty Webb M.B.E. and Mary Every, together with seven other talks complete with all presentation slides and all audience questions. Each DVD is only £7.99, and the PayPal purchase system allows easy and instantaneous currency conversion for all the world. You have a virtual shopping cart, below, by courtesy of PayPal. Simply add to your cart the DVD package you want. Prices include Shipping and Handling (S & H). These are Region-free DVDs, meaning there is no encryption restricting where in the world they can be played. The picture standard is European, meaning that any DVD player and television in these regions can play the discs without a problem: Europe (including the UK), Australia, much of Africa and the Middle East, the Far East, and South America except Brazil. In other countries, particularly the United States of America, Canada and Brazil, a modern DVD player will be able to reproduce this disc, and all modern televisions will produce good pictures. Older players or TVs may exhibit problems. Every computer with a DVD drive in all regions of the world will play this disc.